In the sales field, most entry-level candidates begin at the associate level and work their way up, eventually becoming a senior representative and then a sales manager. At the associate level, employers don’t expect to see years of experience, but they do expect to see a set of relevant qualifications. 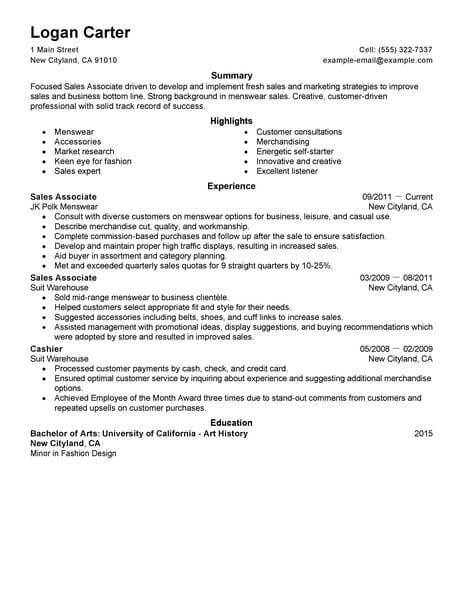 Review this sales associate level resume example and use it as a guide while you create your own profile. Start with a summary that describes your interest in sales, and then create subsections for your education and special skills. If you have some experience, share each previous role and your key accomplishments in these positions. Ready to jump-start your sales career? A sales associate level position can be a great next step. The resume examples below showcase the skills and attributes employers are looking for in a sales associate level employee. 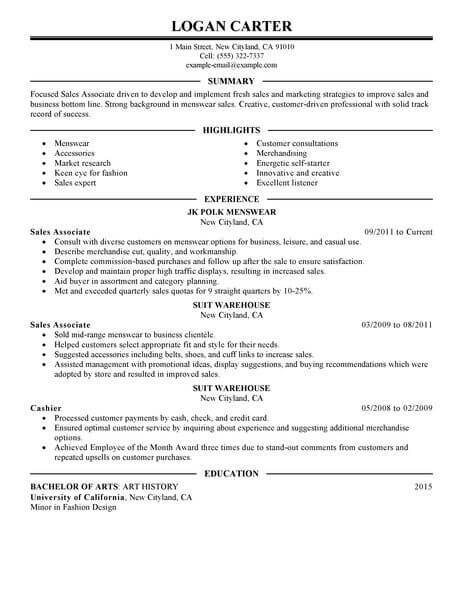 Choose from any of the resume examples below, then personalize your resume to highlight your unique background. The sooner you get started on your new resume, the sooner you can start landing interviews and get hired! Hunting for jobs as a sales associate level takes dedication, a positive attitude, and job-seeking skills. Keep these following tips in mind as you venture out on your search. 1. Establish an online presence, which goes beyond having LinkedIn and Facebook accounts. Read blogs that are relevant to your career industry, and post your own comments. Demonstrate the type of work you do by writing your own blogs, uploading a PowerPoint presentation to your LinkedIn profile, and post relevant content on Twitter (after following potential hiring managers and recruiters). 2. Be mentally prepared for the search. It may take longer than you would like to find the right job, or you may be presented with some difficult situations. Stay positive and don’t let setbacks get you down. 3. Research potential employers. In a cover letter and in an interview, it helps if you mention facts about the company or hiring manager that you admire and make you want to work there. This will help set you apart from the rest of the applicants. 4. Network both online and in person. Talk to everyone you know, and visit networking groups and social hours to meet new people. Follow up online, through email, or even make a phone call to remind people what you are looking for and how you can be an asset. 5. Follow up on all leads. Contact the hiring manager and make it known that you want the position. Don’t give up on a lead until you get an explicit ÃÅno’. Don’t overlook your resume, which is a powerful part of finding jobs as a sales associate level. Whether you are a recent graduate, changing industries, or you were at your last job for a long time, your resume will need a tune up. Use the following tips for a top-quality resume. 1. If you are new to the job market or are changing careers, emphasize transferable skills that relate to the job you are searching for. 2. Employers like numbers, so use them to show how you can improve their bottom line. Use numbers to show how much you increased sales, how many employees you supervised, how many accounts you managed, or how much you decreased the budget. 3. Keep your resume short, but make sure all pertinent information is included. One page resumes are usually preferred, although two pages are fine for those with a lot of job experience. A resume longer than two pages is typically frowned upon. 4. 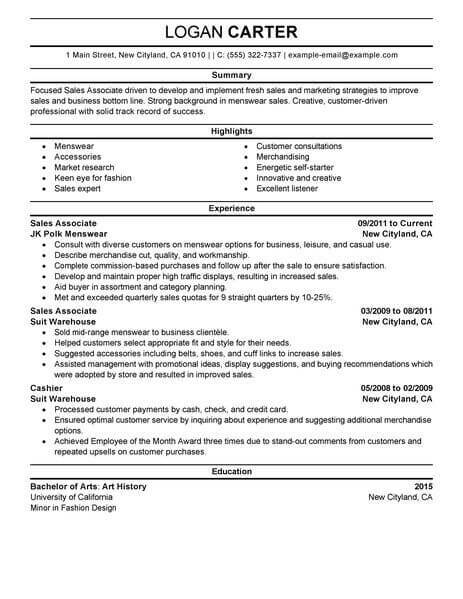 Make your resume easy to read in order to find the right jobs as a sales associate level. Use short paragraphs, make sure your type is flush left, and use bulleted lists to mention skills, accomplishments, and highlights. 5. List your past jobs in reverse order chronologically. Job information should be listed in the preferred order of title or position, then the name of the employer, the location of the employer (city/state), and the dates of employment.